The only means of body protection, at one time were the mate of the warrior. Comfortable and strong shoes that are always the prime requirement for tough and lightning movements. Axes are one of the oldest weapons, a status symbol and are simply great collector pieces. 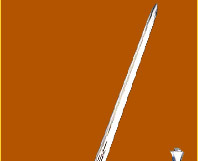 These are weapon on the end of a stick and is specifically an infantry weapon useful to hold an enemy at distance. Most favored type of armor, translates the status symbol of the knights and are ideal armory collection. One of the most dangerous close combat dueling weapons, the craftsmanship of a dagger will always remain unmatched. Deadly weapon made intelligently by the craftsmen. Even minor details can change its effectiveness. 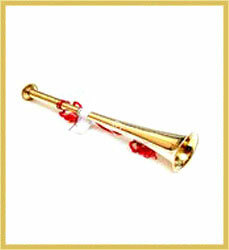 A French musical instrument played by changing mouth positions and amount of wind that passes it. Handcuffs have been the integral part of armaments through the ages. 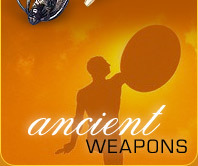 A weaponry collection is incomplete without it. Helmets are considered as one of the most universal forms of armor and forms an integral part of your armory collection. 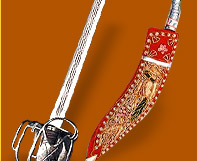 Whatever be the origin, it is today an out an out deadly Gurkha weapon. It is used in religious ceremonies as well as in wars. Crafted beautifully by the unique touch of the craftsmen, these hand held protection devises come in various shapes, sizes and materials. No arm or weapon has so many variations as a sword. The symbol of aristocracy comes in innumerous patterns. 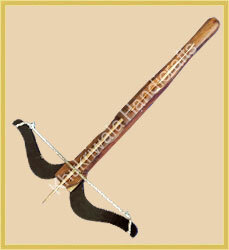 Tomahawk is a light axe earlier used as a tool or weapon and decorative enough to embellish your place. Not just a support, they mark the style. It was at one time a mark of the privileged class. A royal collection of badges, handcuffs, forage caps and many more to add to your chivalry. Providing various leather items like leather cartridge pouch, leather belt, leather rapier belt, cow belt, shoulder protection pairs. 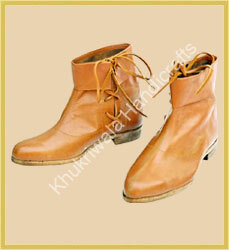 Made using matured wood, we offer a range of wooden crafts that are both functional as well as attractive. Treasure boxes, spectacle cases, all can be availed from us at competitive prices.